Gill at Journal Craft Inspiration has several "Floor Plan" drawings on her blog for inspiration and I thought I would give it a try. My first home, from birth through 3rd grade, was a second floor apartment in this house in Clifton, New Jersey. I had no problem remembering the floor plan and had fun making the memory page. I am an only child and had my bed on the living room couch. When I was sick, my blanket and pillow remained there during the day giving rise to the concept of a "sick bed" which I always created for my children on the family room couch when they were home from school. Now my daughter and oldest son do it for their children. This barely qualifies as an award, but I couldn't find the quilt ribbons I received many years ago, and I've been thinking of sketching it anyway. In July 2005 I reconfigured my job description and gave up clinical medicine and training of young physicians - retaining my role in the medical school 3 days per week. I wanted to have more time to spend with my grandchildren and just have fun. 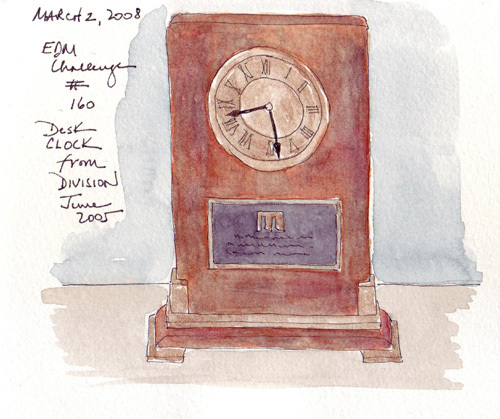 My hospital colleagues presented me with this lovely clock which now sits on a shelf in our apartment library. I tell everyone that it is the wristwatch commonly given to men at retirement! 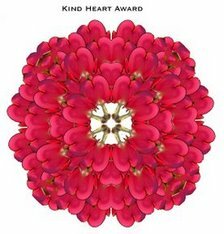 Saturday I received the Kind Heart Award from Mellanie - and the award is so pretty that I wanted to post it here and thank her. I don't know where the award originated, but appreciate the kind sentiment. EDM is a wonderful community of fellow artists - all working hard to improve their skills, and support and inspire others. I am grateful for the advice so freely given on our message board and the comments left on my blog that spur me on. I'm hoping that everyone who sees this on the EDM Superblog will realize that it is a really big thank you from me to the active members of EDM. There are many, many museums in the city and I love to visit the art museums to see the exhibits and sketch from the Masters. We saw a Leon Kossoff drawing exhibit at the National Gallery in London and I was impressed with his return visits to sketch the same few works by Masters many times during his career. I thought it might be fun to try this, in part to see how my art skills evolve and how my familiarity with the painting may change my drawing over time. 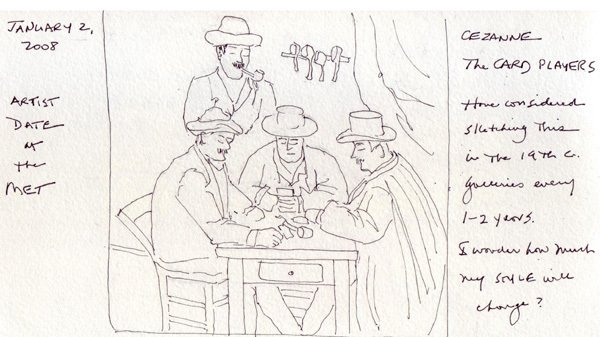 The Galleries for 19th- and Early 20th-Century European Paintings reopened on December 4th after renovation - so on my first visit to the Metropolitan Museum of Art in 2008, I sat in front of Cezanne's Card Players and sketched it. I am concentrating on sketching figures again in 2008 - with faces - so this seemed like a good painting to revisit again and again. Please don't let them move the bench from in front of the painting! Pen and paints aren't permitted in the Met, so I took a photo and plan to paint it soon. We visited the Museum of Modern Art with out of town house guests several weeks ago and while my husband toured the 5th floor Painting and Sculpture I exhibit with them, I spent 25 minutes sketching. I love the view from a window in the Picasso room on the 5th floor of MoMA of the top floors of a townhouse across W54th Street - and have many photos of it that I took during previous visits. This time I spent 15 minutes sketching it - again in pencil because of museum rules. Yesterday I found a full charcoal drawing of the same house in Drawing magazine (Winter 2008). 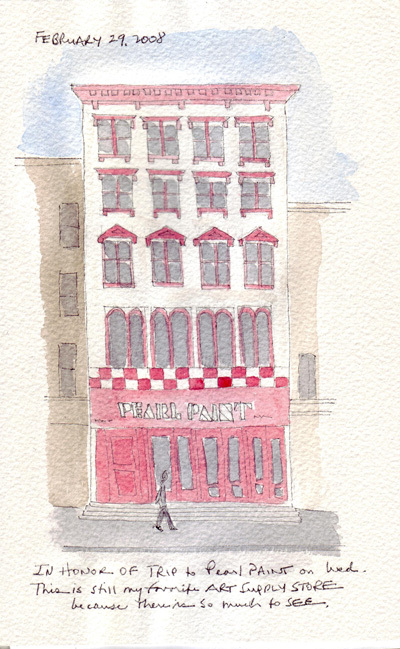 Artist Anthony Mitri wrote that his drawing of the house and surrounding buildings took 6 months! 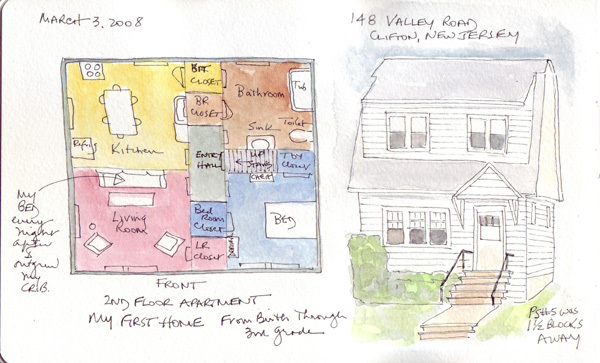 I will redraw this house soon and try to do it justice. 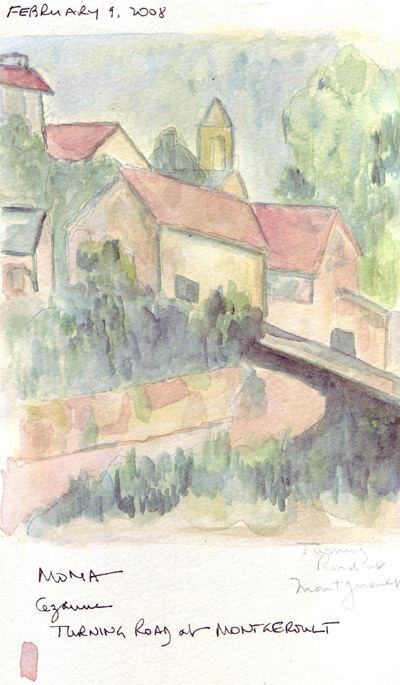 After sketching from the window, I did a quick sketch of Cezanne's painting "Turning Road at Montgeroult." 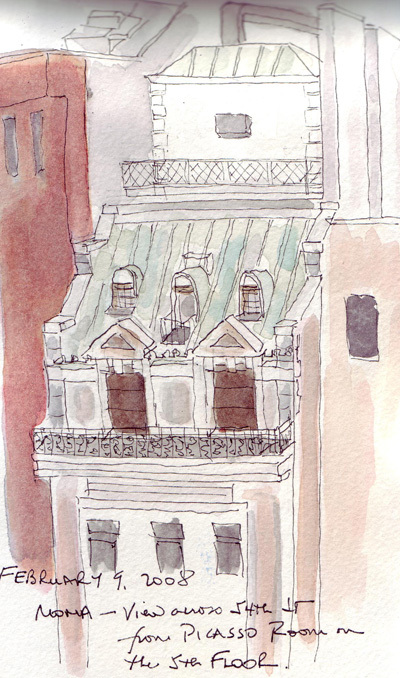 I love views of rooftops and always was attracted to this painting in the permanent exhibit. I painted it at home in several sessions trying a yellow underpainting and mixed complementaries for the color of the houses and roofs. Watercolor and oil paints give very different results, but I had fun with this and I think learned a lot from copying his composition. This week I made a quick visit to the Morgan Library and Museum to see their current exhibit entitled Michaelangelo, Vasari, and their Contemporaries: Drawings from the Uffizi. I chose a simple drawing by Baccio Bandinelli to copy and except for the tilt of the head managed to capture the rest of the lines and the type of shading used. 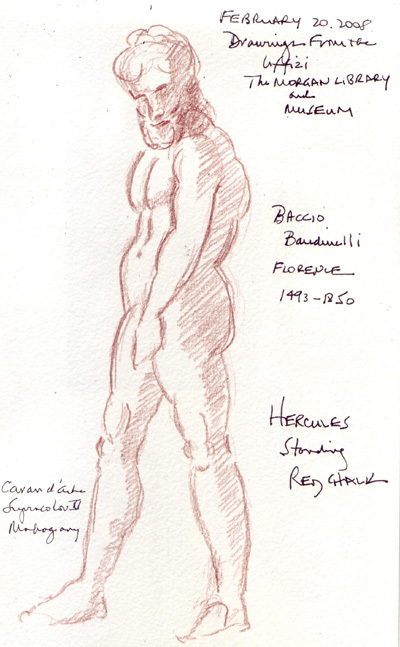 This drawing was a study for his Hercules sculpture that is opposite Michaelangelo's David in front of Palazzo Vecchio in Florence. There were many other wonderful drawings, but it was crowded and I had to select one that I might copy quickly enough while standing and trying to manage sketchbook, pencil, bag etc. I have two favorite kitchen tools. 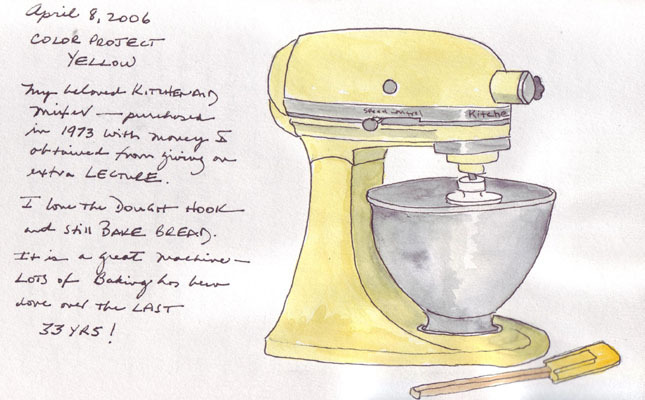 My 36 year old Kitchenaid was posted on this blog in 2006 when I was doing my color project during yellow month. 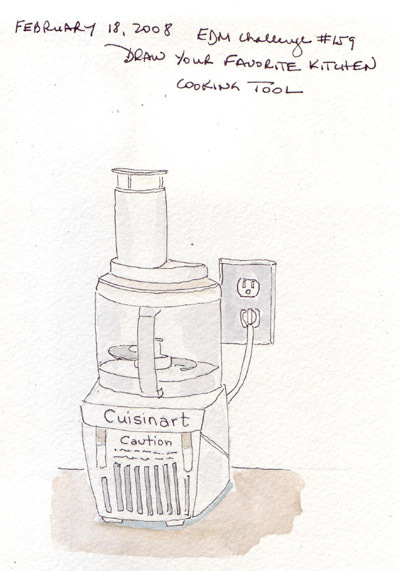 So this time I sketched my 30 year old Cuisinart! They are very reliable machines and have been used regularly for many years. We don't cook as often anymore, but the Kitchenaid was used twice recently when Sydney, Henry, and I baked cookies.